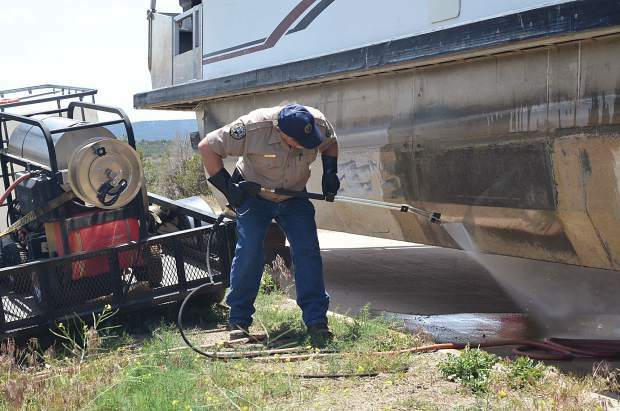 Colorado Parks & Wildlife inspectors conduct boat decontamination procedure at Navajo Lake in June 2018. In order to keep destructive quagga and zebra mussels out of Colorado lakes and reservoirs, boaters are being required help to provide crucial funding for the state’s Aquatic Nuisance Species Inspection Program starting this year. “Colorado is one of just a few states in the country that doesn’t have an infestation of adult zebra or quagga mussels in any of its waters,” Elizabeth Brown, invasive species program manager for Colorado Parks and Wildlife, said in a news release. Last year, the Colorado General Assembly approved a bill that requires those who operate motorboats and sailboats on waters of the state to purchase an ANS stamp annually. The cost of the stamp for Colorado residents is $25. For boaters coming to Colorado from other states or provinces, the stamp will cost $50. The stamp fee is separate from the annual boat registration permit but will be included in the cost of registration for in-state boats. The stamp and registration is currently available for residents at CPW offices and the agency website. Boaters coming from other states can buy their stamp online, at CPW offices or at any sales location beginning in January. According to the CPW, mussel infestations cause a variety of major problems. Since the ANS program started in Colorado in 2008, CPW staff and other entities have completed 4.4 million boat inspections, more than 90,000 boats have been subject to decontamination procedures and 195 vessels with confirmed mussel infestations have been intercepted and decontaminated, according to agency statistics. “The threat of boats transporting mussels also appears to be growing,” the release states, adding that, in 2018, 51 boats with adult mussels were found at inspection stations, more than the previous record of 26 boats in one year. The new fee will cover half of the cost of the inspection program, according to CPW. The remainder will be paid by CPW, as well as federal agencies, local governments, water providers and other partners.